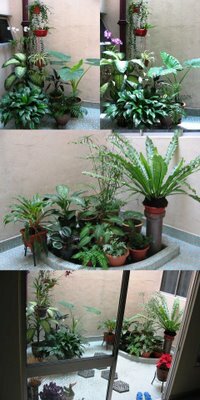 This courtyard adjoining our dining hall, though small with an area measuring 13 feet by 8 feet, is definitely big enough for us to indulge our gardening passion and do some workouts and breathing exercises to keep fit, all within the privacy of our home. We love this open space area that not only provides good ventilation and sunshine into our home, but let us have a peek at the sky and sparrows that occasionally perch on the grill fixed above for security precautions. A wonderful place to meditate and do quiet reading with natural lighting (hehe…save electricity :D), relax amidst greenery and away from noise and car pollution, yet still able to enjoy the chirping and merry singing of birds on the huge trees across the road outside our home! 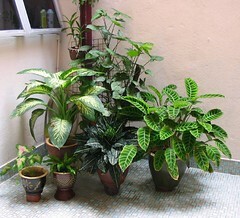 Our potted plants are grouped into small families and they do seem happy being cozily grouped together. We know for sure that our babies are happy when they greet us with their lovely healthy shining faces! I suppose they’re like human families, longing to be loved and united together with tender, loving care. In fact, these babies are the first to greet us with their smiling faces in the morning as we descend the stairway from our bedroom upstairs. What a delightful and joyful sight to start the day with. Thank you, loving God for this wonderful blessing! 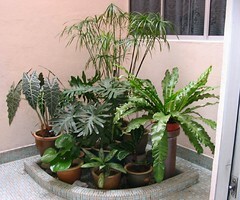 Update: September 29, 2008 – see how our courtyard garden currently is here.